All pregnant and breastfeeding women and children from 4 weeks until 5 years old need vitamin supplements (for children who are having 500ml or more of formula a day these vitamins are not needed). Vitamins are essential nutrients that your body needs in small amounts so that it can work properly. Even though you can get lots of vitamins from a healthy balanced diet, you still might not get everything you need at certain times in your life – such as when you’re pregnant, a new mum or a small child. It is recommended that at these times you should take a supplement containing specific vitamins to make sure you get everything you need. Healthy Start vitamins are suitable for vegetarians and halal diets, and free from milk, egg, gluten, soya and peanut residues. Vitamin D: helps your body to absorb calcium and so supports your baby’s bones to develop properly. Vitamin D deficiency can lead to osteomalacia, which causes bone pain and tenderness. Vitamin D: for strong bones and teeth. In children a lack of vitamin D can lead to rickets. There are a range of other vitamins available, however many of these contain a range of nutrients that are not suitable, therefore Healthy Start Vitamins are the only vitamin supplements we recommend for your child. 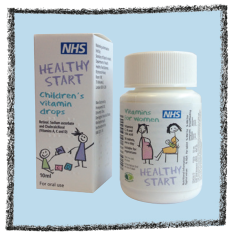 Healthy Start Vitamins are available to buy from your Children’s Centre at a reduced cost. Visit the children centre page to find your nearest children centre. You may also be eligible for free vitamins through the Healthy Start scheme.